(U//FOUO) The anti-government sovereign citizen movement has been catapulted into the forefront of public attention due to an increase in criminal activity by sovereign citizens nationwide. The movement consists of individuals and small groups throughout the United States, guided and supported by adherents who share the core belief that Federal, state, and local governments are all illegitimate entities. (U//FOUO) For the most part, the sovereign citizen movement has been nonviolent, and its adherents have engaged in activities that are not illegal, such as renouncing citizenship and self-identifying as sovereign citizens. However, nationwide there have been individual self-identified sovereign citizens who have displayed extreme and sometimes violent behavior. The most notable violent incident between law enforcement and sovereign citizen extremists was the killing of two police officers by Jerry Kane and his son Joseph during a traffic stop in West Memphis, Arkansas, in May 2010. Although no encounters between sovereign citizens and law enforcement in New Jersey have resulted in death, some individuals who have self-identified during traffic stops or during court proceedings have become physical and/or confrontational during their interaction with law enforcement. (U//FOUO) Many believers of the ideology conduct illegal activities, such as debt elimination and redemption, document fraud (false passports, birth certificates, and driver’s licenses), insurance fraud, money laundering, and residing in foreclosed homes. Many of the tactics used by sovereign citizens are common occurrences in New Jersey, with the exception of seizing foreclosed homes. 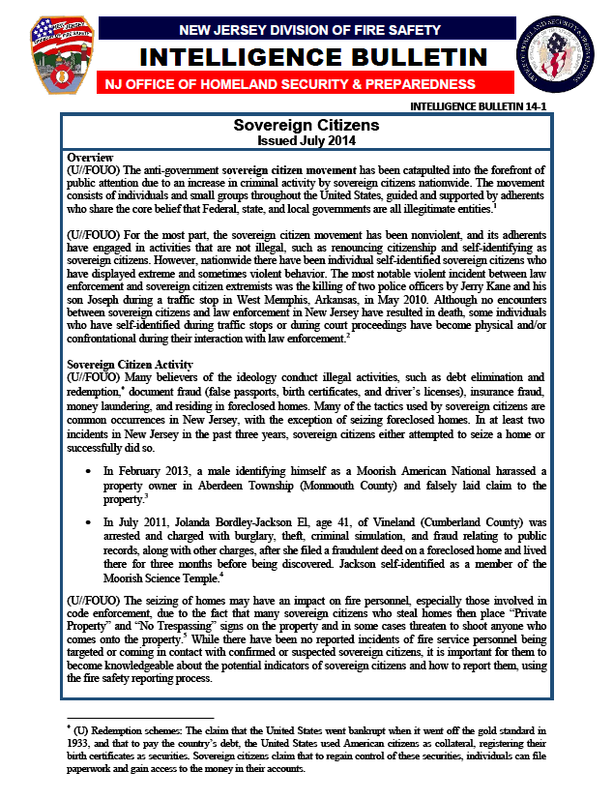 In at least two incidents in New Jersey in the past three years, sovereign citizens either attempted to seize a home or successfully did so. In February 2013, a male identifying himself as a Moorish American National harassed a property owner in Aberdeen Township (Monmouth County) and falsely laid claim to the property. In July 2011, Jolanda Bordley-Jackson El, age 41, of Vineland (Cumberland County) was arrested and charged with burglary, theft, criminal simulation, and fraud relating to public records, along with other charges, after she filed a fraudulent deed on a foreclosed home and lived there for three months before being discovered. Jackson self-identified as a member of the Moorish Science Temple. (U//FOUO) The seizing of homes may have an impact on fire personnel, especially those involved in code enforcement, due to the fact that many sovereign citizens who steal homes then place “Private Property” and “No Trespassing” signs on the property and in some cases threaten to shoot anyone who comes onto the property. While there have been no reported incidents of fire service personnel being targeted or coming in contact with confirmed or suspected sovereign citizens, it is important for them to become knowledgeable about the potential indicators of sovereign citizens and how to report them, using the fire safety reporting process. If the situation is not safe, back away and request law enforcement assistance, and advise that you are dealing with a sovereign citizen.